Me and my Dadd and Mark Chadbourn. Reason tells me that I would have first encountered the painting itself, the enigmatically titled Fairy Feller’s Master Stroke, reproduced, pretty much full-sized, in the fold-out cover of a QUEEN album, at the age of fourteen or thereabouts, and it made no impression upon me at all. That’s one of the odd things about it. You have to see it in the flesh, paint on canvas, the real thing, which hangs, mostly, when it isn’t travelling, in the Pre-Raphaelite room of the Tate Gallery, out of place among the grand gold-framed Pre-Raphaelite beauties, all of them so much more huge and artful than the humble fairy court walking through the daisies, for it to become real. And when you see it several things will become apparent; some immediately, some eventually. When I was in my early twenties I received a copy of a book to review, of photographs taken by a Victorian doctor named Diamond, of the inmates of Bedlam. Hopeless bedraggled lunatics who wring their hands as they squint at the camera, posing awkwardly for the period of time it took for the photographs to be exposed; their faces are frozen, although their hands often blur into things like the wings of doves. Portraits in madness and pain, and in only one of the photographs was a man, a lunatic like the others, actually doing something. The madman in the photograph has a beard. He has an easel in front of him, on which he is executing an oval painting of remarkable intricacy. He stares craftily at the camera, and there is a small, fierce smile on his face. His eyes glitter. 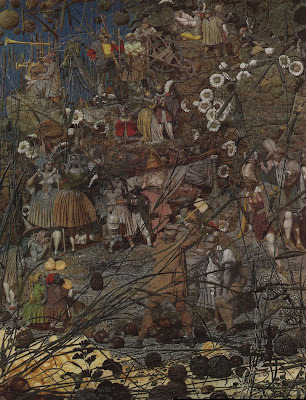 He looks squat and proud, and when, a year later, I saw for the first time in the flesh, his masterpiece, The Fairy Feller’s Master Stroke, the first thing I realised was that the white-bearded sorrowful dwarf who dominates the centre of the painting, staring out at the watcher, is Richard Dadd grown old. The people in the Tate Gallery who visit the Pre-Raphaelite rooms are there for their own reasons, and are responding to something distant and melodic. The Waterhouses and the Millaises and the Burne Joneses exert their own magic: spectators wander past the paintings, their lives enriched and made special. The Dadd, on the other hand, is a snare, and those people with a place in their soul for it are hooked. They can stand in front of that painting for, literally, hours, lost in it, puzzling over these fairies and goblins and men and women, trying to understand their size, their shape, their eccentricities (“Every time you looked you saw something new, “ as Mark Chadbourn’s narrator, Danny, unreliable on so many points, but reliable here and on this, informs us). Dadd knew who they were, the people in the painting. He knew their lives. He knew what they were. You know that when you see them. If you’ve ever seen the painting reproduced, if you’re on a journey specifically to see it, then the next thing that will surprise you is the size. It’s smaller than you imagined – smaller than seems possible. There is so much to fit in, after all. The authorised Tate Gallery reproduction of The Fairy Feller’s Master Stroke I bought after seeing it the first time was almost twice the size of the picture itself. And the painting is not the reproduction. The thing itself, in its frame, has a magic – in the colour, in the detail -- that no photograph, no poster, no postcard, ever seems to begin to capture. So, like Danny and his mother, you look at the painting, seeing every brush stroke. And you can look at it for hours before you notice something else about the painting, something so big and strange and obvious you can’t understand why you didn’t see it at once, or why no-one else has commented upon it. Much of the bottom of the painting, where the colour choices seem odd and washed out, are only outlined on the light brown of the undercoat of canvas. The fawn-coloured grass that pushes the eye up to the Feller himself is fawn because Dadd – who took many years to paint it – ran out of time. He gave it away before it was done. And there’s one final thing you will know, without question, if you’ve seen that painting in the flesh, and it’s this: he knew what he was painting. He had seen it, through those crafty eyes. He had gone on the great journey, the grandest of grand tours, and this was what he was bringing back. There was a sense that one of the great secrets of the universe would be revealed if one could only examine it long enough to divine the clues, says Danny, says Mark, and they’re right, of course. Before his madness, before the murder of his father, before the ill-fated journey to France (he was arrested on a train, when he attacked a fellow passenger, on his way to Paris to kill the Emperor) Dadd’s paintings are quite pretty, and perfectly ordinary: forgettable chocolate box cover concoctions of fairy scenes from Shakespeare. Nothing special or magical about them. Nothing that would make them last. Nothing true. And then he went mad. Not just a little bit mad, but quite spectacularly mad; a murderous patricidal madness of demons and Egyptian gods. 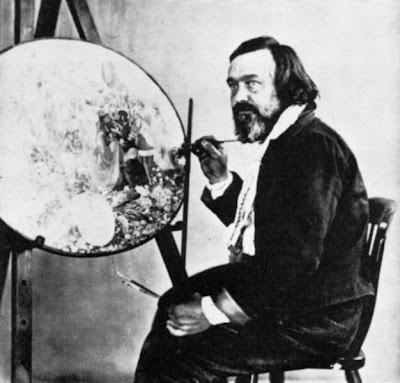 He spent the rest of his life locked up – first in Bedlam, later one of the first prisoners in Broadmoor – and, after a while, he began to paint, trading his paintings for favours. Gone were the chocolate box fairies. Now there was an intensity to his paintings and drawings of fairy courts, of bible scenes, of his fellow inmates (real or imaginary), that makes those we have such treasures. They were worked on with an intensity and single-mindedness that is, quite simply, scary. He spent the rest of his life behind bars, locked up with the dangerously insane, as dangerously insane as any of them, but with a message for us from, as it were, the other side. Apart from this, his life was wasted. Still, he left us paintings, and riddles, and one unfinished painting (donated to the Tate by, if memory serves, Siegfried Sassoon) which continues to obsess. Angela Carter wrote an astonishing radio play, Come Unto These Yellow Sands, about the painting, Dadd’s life, Victorian art. I wrote a film treatment once in which the painting was a key, and came close once to organising an anthology in which each story would be about one of the witnesses to the Fairy Feller’s chestnut-smashing blow. And now Mark Chadbourn gives us a novella, in which the painting is a clue (perhaps), a murder-weapon (possibly), and above all, and unquestionably, a key: a key to a life, to a family, to mysteries, to solutions, to madness and to, above all, reality. It’s a story of a life wasted, of love and of pain, and of a place in which Dadd’s painting and Dadd’s life become both a template and an excuse: a reason for living, and a reason for dying, and it is not until the very end that we understand what we have read.